We all know how shopping is an institution in Singapore or even an obsession. Here, as soon as the month of April begins, Orchard Road shopping belt can once again spree in its fashion fixation with some much awaited fashion shows. Calling all fashion and lifestyle lovers! This year between the 4th of April and the 18th of May 2014, Fashion Steps Out 2014 (FSO) leads off all the excitement around the spring /summer season 2014. During this six-week shopping fiesta, see Orchard Road turning into the longest outdoor runway you’ve ever seen. Be spawned by the latest collections of some of the fashion world's maestros. And get in the know of what to wear this season and who to watch among our local designers. There will be abundant displays of thrilling fashion flairs and attractive advantages you shouldn’t miss. This Saturday night on the 5th of April, be ready for some traffic disruption around the Orchard Road area. This is not Christmas time but Fashion Steps Out 2014 hailing the spring /summer season 2014 in style. 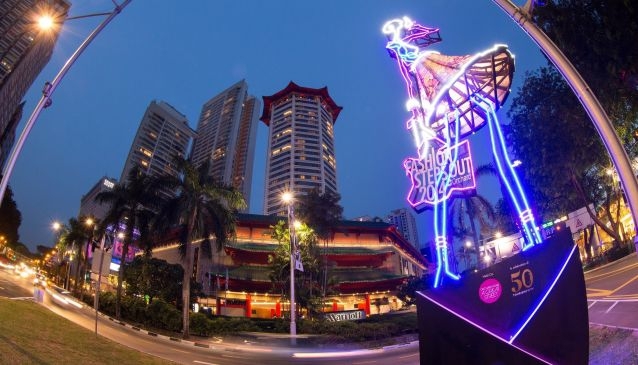 For the first year, visitors will be greeted at the Paterson/ Scotts junction of Orchard Road with a 10-metre tall icon of fashion, sparkling at night during the whole festival. On that day, part of Orchard Road shopping belt will be closed to traffic as it makes way for not less than 150 models walking up and down the 660-metre long asphalt between Scotts Road and Bideford Road. During the infamous Orchard Fashion Runway, they will be presenting the latest creations by nine established fashion brands including Aimer (featuring its beach wear collection), local designer DEPRESSION, MAX&Co., Robinsons, The Reckless Shop and i.t. At My Guide Singapore, we’ve had a particular crush on the splendid pieces of work produced by international fashion designers Ashley Isham, David Koma and Manish Arora. As they say, behind all great creators there is a muse in the shadow. For this season, Singapore’s pride Ashley Isham was inspired by the French drama movie “Belle de Jour” (Beauty of the Day) by Luis Buñuel, in which the main character Severine, leads a double life as a housewife and a prostitute. This paradox is illustrated in the frequent use of cloche hats (House of Flora) masking the eyes and in the way fabrics or shapes clash with one another: dresses above-the-knee have silk fronts and broderie anglaise backs, PVC capes or skirts are edged with lace garments while fluid jersey pant suits from the front are actually one-piece glamorous gowns. The resulting effect is a classic elegance with a modern twist. In his spring/summer 14 influenced by the Kyudo, the Japanese martial art of archery, David Koma’s woman appears powerful and confident with pieces being sharp and structured as if she was wearing an armour. At the same time the perfect lines of Koma’s signature bodycon dress, make her indefinitely classy and ladylike. 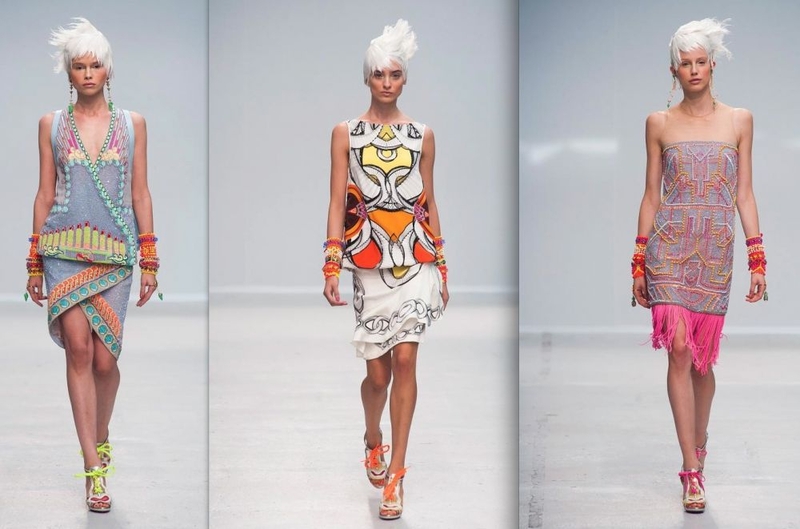 The world-renowned Indian fashion designer Manish Arora loves colours and beadings and his ready-to-wear spring/summer 2014 collection is no exception. Dreaming of Josephine Baker at a rave party, he created some whimsical 20s- inspired flapper dresses with subtle elements of Art Deco and psychedelic colours. There’s no doubt about it, all party girls with a flair for sophistication will love to wear them. The Fashion Steps Out is also a valuable platform for local designers and young talents to showcase their work. This year four local designers featured from brands such as The Reckless Shop, SABRINAGOH, MATCHBOX and Sans & Sans had some pieces of their spring/ summer collection displayed at the Local Labels Exhibit @ Orchard Central since the 27th of March and will be available for viewing until the 11th of April 2014. Young designers will also have their say. Between the 5th and the 18th of May 2014, 30 budding talents of Raffles Design Institute will be challenged during the Fashion Reimagined to convert shopping bags from Adolfo Dominguez, Anteprima, G-Star Raw, GUESS, Karen Millen, Paragon and POIS into wearable and fashionable apparel. And for those lucky ones who have been invited, Fashion Steps Out will hold for the first time the Orchard Fashion Runway After-Party held on Satuday 5th April at Topshop Topman Knightsbridge. As Mrs May Sng, Chairman of Orchard Road Business Association (ORBA- the organiser), said: “…the sheer array of merchandise on catwalk is actually available for sale in our Orchard Road stores”. After having been inspired by so much elegance, you’ll be ready to liven up your closet with fresh new looks. Get your MasterCard at hand for some attractive shopping privileges. If you charge S$300 to your MasterCard at any of the participating shopping malls you’ll be able to redeem a S$30 shopping voucher. There will be also shopping vouchers to win in the Shop, Dine & Win Draw with every S$50 spent at any outlet (including shops and restaurants) of the participating malls and if you charge your purchases to MasterCard, you’ll multiply by 3 your chances of winning. Participating malls: 313@somerset, Forum The Shopping Mall, ION Orchard, Mandarin Gallery, Orchard Central, Paragon, Ngee Ann City/ Takashimaya Shopping Centre, TANGS Orchards, The Centrepoint, Wisma Atria. Now that you know what to expect for the 5th edition of Fashion Steps Out 2014, join the fashion revelry this Saturday and get a closer look at this season latest trends at the Singapore's longest outdoor catwalk. On that day Orchard Road will be closed to traffic between Bideford Road and Scotts Road from 8pm to 10.30pm. For the diversion route of SBS buses 7, 14, 16, 36, 65, 111, 123, 124, 143, 162M, 174, 175, 502 and 518, please visit SBS transit website. For the diversion route of SMRT buses 77, 106, 167, 171, 190 and 700A, please visit http://www.smrt.com.sg. Watch the video of Fashion Steps Out 2014.